Charles William Pinkney was born in Smethwick in 1856, the only son of John and Ann Pinkney (nee Holmes) and baby brother to three sisters, Emma, Ann and Elizabeth. ​He was my Great, Great, Great Grandad. He was a gas engineer and he was an inventor! ​My Nan on my Dad's side has saved lots of very interesting newspaper clippings and information about Charles and it's from those articles that I've learned a lot about my ancestor and hope you will find it as fascinating as I have. Such is the importance of this great man, I decided to dedicate a whole page of my website to him, rather than just a short blog post. Charles was educated at the Holy Trinity School in Smethwick and later attended evening classes arranged by the revered Head Master of Spon Lane School, West Bromwich. It seems even as a child and young man it was recognised that he had huge potential and how right they were as he became a captain of industry and an eminent gas engineer as well as a prominent character in the town where he lived. ​59 Regent Street, Smethwick, Staffs. He'd met and married Martha Bellingham in the early 1870's and had only one child, a son called John Pinkney born in 1876, who went on to marry Hannah and have two daughters. John followed in his father's footsteps and also became a gas engineer but not such an acclaimed engineer as Charles and sadly died quite young. 1876 In the year his son was born Charles joined Tangye Brothers at their Cornwall Works, a huge employer in Birmingham where they manufactured pumps, lifting equipment, engines and machine tools. It was here where Charles really made his mark. His inventiveness and experience made him extremely valuable to the Tangyes and he was soon put in charge of the gas engine ‘sheds’. His opinion was heavily relied upon for the assessment of new gas-engine inventions submitted to the firm. 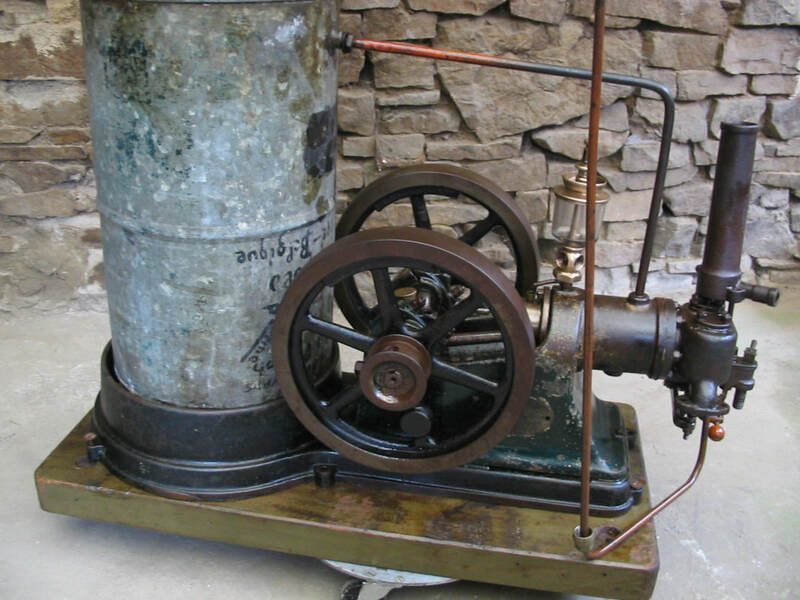 ​1889 The company began building a Clerk’s patent two-stroke gas engine. 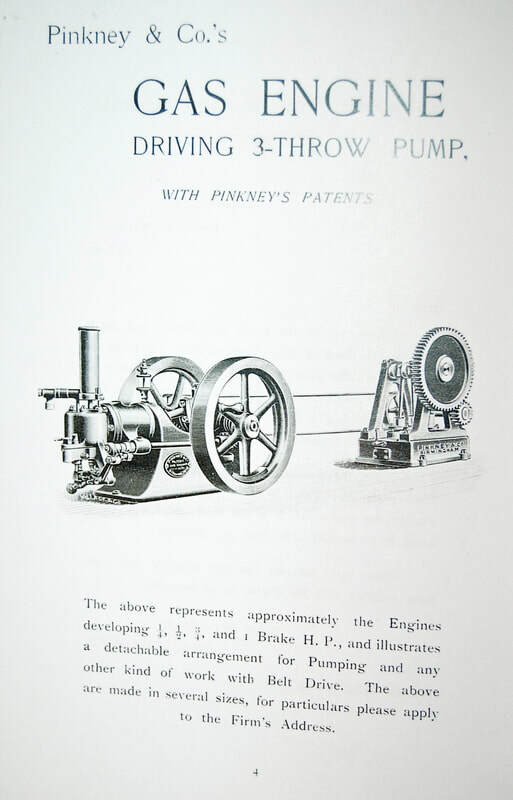 However, in the meantime Charles Pinkney had designed a new four-stroke engine. He worked closely with Robson on this and was responsible for considerable improvements in the design of the gas hammer. 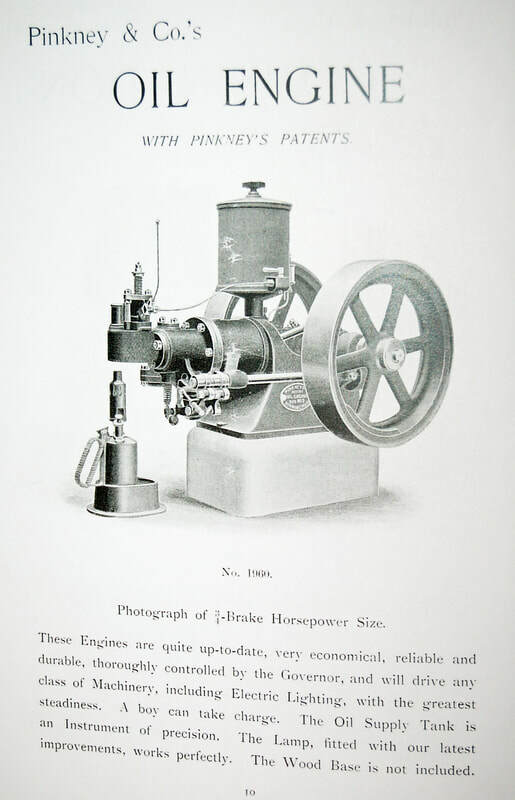 Charles's gas engine was ready by 1889 and was found to be slightly more economical than the German designed ‘Otto’ engine they'd been manufacturing. 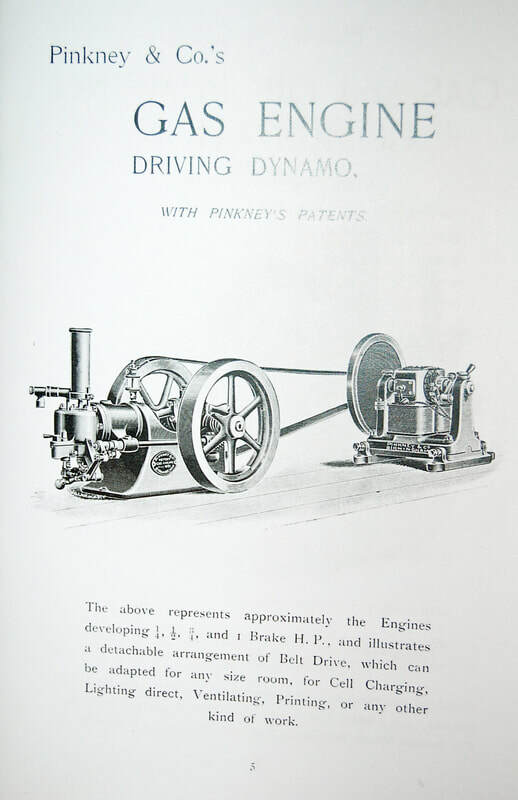 In the late 1890's, Charles was developing a petroleum engine which he patented in 1891 and became the refined petroleum engine which Tangyes introduced in 1892. 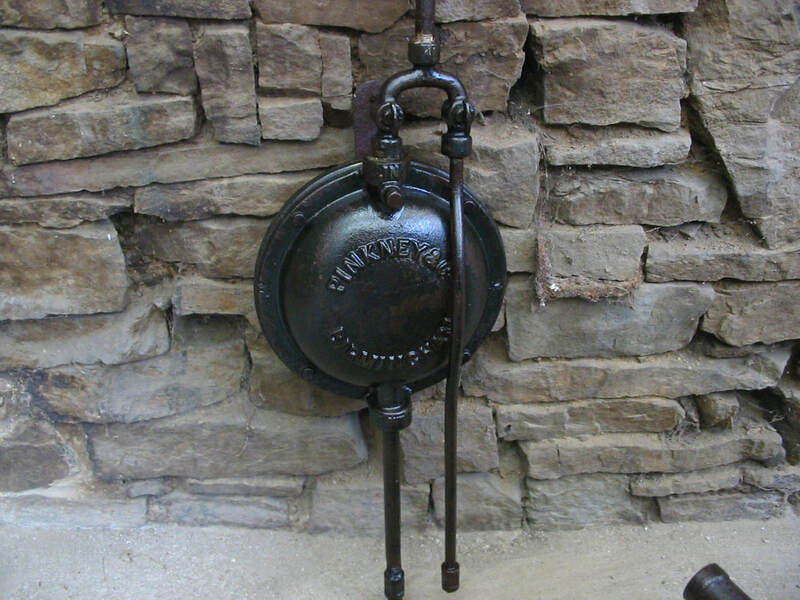 1880 saw the manufacture of the James Robson and Charles Pinkney gas hammer. Tangyes won gold medal at the Paris exhibition for this. 1894 Pinkney designed a ‘Hydro-carbon Gas Producer’ but Tangye's didn't develop it for reasons unknown. "The engine draws the water out of a tank that forms its base, and forces it through the cylinder jacket and thence through a pipe from the top of the cylinder, on to a canopy, where the water is split up and cooled while being exposed to the atmosphere. The water next passes on to the roof of the carriage where it is collected and allowed to drain back into the base or tank of the engine, and used over again." My Nan has a printed hard-back book which details all the specifications of his inventions, complete with drawings. One of those engines is still running today. Video and photos below are courtesy of Roland Servais, Belgium. Roland found the engine in a cellar in Liege city in 2007. It was previously owned by a dentist who bought it in Paris before WW2 when it was being used to power a children's carousel in a park. - On 1st November 1900 Charles Pinkney was elected to the Town Council for Soho near Birmingham, where he was resolute in defending the district's only commercial proposition, the Gas Corporation and championed the cause to keep gas at the forefront of the lives of the people of Smethwick and surrounding areas. - On 19th July 1904 he was elected Alderman, a high-ranking officer of the council who is elected by other council members. - He was offered the position of Mayor several times but refused to take it and preferred the status of Alderman where he felt he could do more good for the town he so loved. - He was a Magistrate and Chairman of the Licensing Magistrates for almost 20 years. 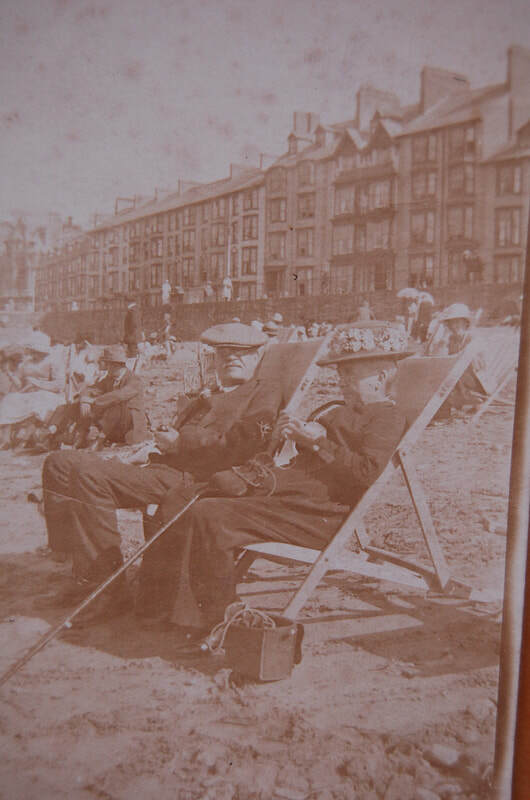 - He was largely responsible for launching a scheme of reform which brought into effect better housing in the area. According to the huge tribute to him in the local rag of the day, The Smethwick Telephone, he "was a housing reformer long before the Council were called upon to provide houses for the working classes". - He was Chair of the Watch Committee from 1928, for eight years right up to his death. The Watch Committee was a local government body which oversaw policing and appointed constables to preserve the peace. - His engineering skill and knowledge were of great significance in connection with the then ever changing character of the equipment of the Fire Brigade and Ambulance Service. 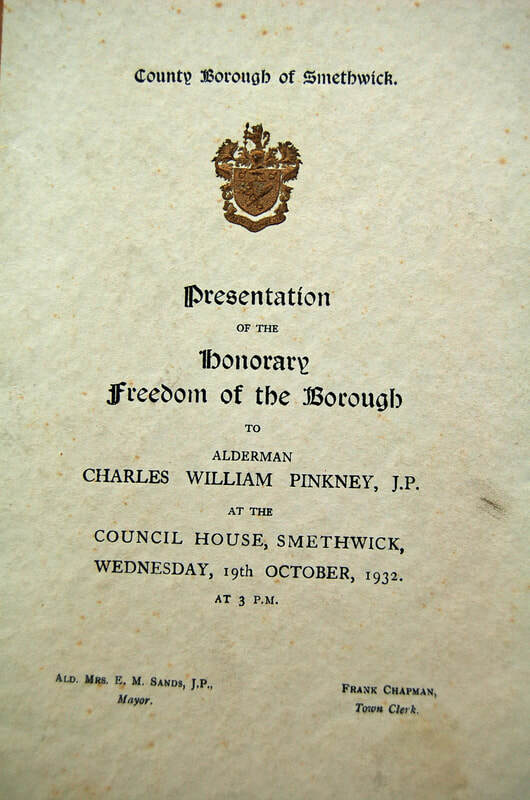 On 19th October 1932 at 3pm Charles Pinkney was awarded Freeman of the County Borough of Smethwick. He was presented with a solid silver casket and The Freemans Scroll which bore testimony to the outstanding public service rendered to Smethwick for more than 30 years. ​It was resolved that this Council, in testimony of the outstanding public service rendered to Smethwich for more than thirty years by Alderman Charles William Pinkney JP, the Senior Member of the Council, in recognition of his notable achievements in the applied science of engineering and in grateful acknowledgment of the readiness with which his scientific knowledge, his technological enthusiasm and his wide experience of public administration have been employed for the benefit of this, his native town, do hereby record their high appreciation of his career of public service and in particular his long and invaluable labours to the upbuilding of the Smethwick Gas Undertaking, his worthy assistance in the advancement of education in the Borough, especially on its technical side, his manifold activities as Chairman of the Watch Committee, his meritorious work as a Borough Magistrate and his conscientious discharge for many year of the duties and responsibilities of Chairman of the Licensing Committee. And in pursuance of the Honorary Freedom of Boroughs Act 1885, do hereby confer upon him the Honorary Freedom of this County Borough and he is hereby admitted to be an Honorary Freeman of the County Borough of Smethwick accordingly. ​My Nan remembers the ceremony at the Council House well. She was only about 6 years old and was the only great-grandchild at the time so a big fuss was made of her. She remembers very clearly riding in the fancy car with him and wearing a brown coat with a velvet collar. She insisted on having a particular pair of shoes she'd seen for the occasion and her love of shoes and fashion continues to this day at the grand young age of 91. Nan used to love going to his house as a child - that's them together on the right. Having lived on a farm in rural Clent, she was fascinated by the lights and life of what must have seemed like a huge town. She also remembers the house with its extravagant gas lighting and her Great Grandfather's huge workshop at the back of his house on Raglan Road, Smethwick where he and his employees worked on all things mechanical. Such was his standing in society by then, he had two maids, one called Rose, who used to take Nan to Meesons sweet shop whenever she visited - a very rare special treat. Charles William Pinkney died 14 December 1936 at the age of 80 and his funeral was attended by around 200 family, friends, ex colleagues and top brass of the day, including the Mayor, Deputy Major, numerous council officials, JP's, Chairmen of various companies and esteemed organisations, police chiefs and Fire Brigade representatives. The Obituary in the local paper was a full column length long and portrayed him as an outstanding citizen of his day, kind and generous. He was hard-hitting when it came to getting things done for the Borough he loved but it seems changes were made only ever for the benefit of the community and he died a well loved and extremely respected gentleman. "No man touched the life of any community at so many points". ​The Reverend Hugh Singleton who took the funeral service said that he recalled his first memory of him. "He had been a poor child himself and he knew what it was to be left outside while others went into the warmth and glow of a party. It was because of that that Mr and Mrs Pinkney resolved that they would provide a Christmastime party for the young people. When I came to the town, the parties were held in the old Town Hall on Boxing Day and I was amazed to see a thousand children sitting down to a fine spread and being exceedingly merry through it all. Every child knew when the treat was over there would be a gift to take home, some warm clothing or maybe a pair of boots. Alderman Pinkney loved the children, but he loved poor children best. From a poor background he became friends of the poor and welcomed anyone who was in trouble. He was a man who could lift the burden from the troubled heart. He went about doing good"
The Major at the time of his death, Dr T Clyde McKenzie) said of him: "The Alderman was a man of great ideals, of great ingenuity and of strong character. Determined yet always kind and helpful, especially to those who were younger and less experienced. Alderman Pinkney was one of the men who had left his mark on the town. His was a mark that was imperishable". And now, almost 100 years later, it seems fitting that here I am, his great, great, great grandson, a gas heating engineer. ​I would like to have met and chatted to Charles Pinkney, I think we would have got on quite well.